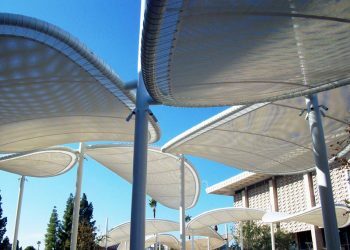 Tensioned membrane architecture offers superior flexibility for architects who are looking for innovative solutions for overcoming design challenges. 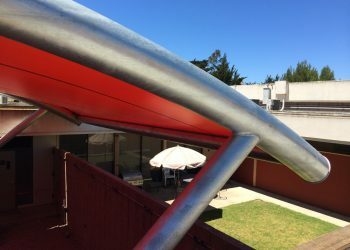 As full-service design-build manufacturers, we understand the importance of having expert guidance in order to achieve your goals. 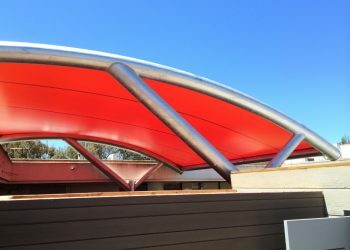 From styles and shapes to fabric and frames to cable functions and tensile structure fabric attachments, our experienced designers and engineers help you choose the best-suited options for your projects. 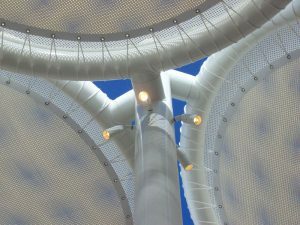 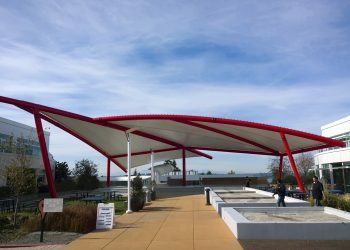 Tensile structure fabric attachments are integral to the design and engineering process because these attachments provide for the meticulous, long-term tensioning of the membrane. 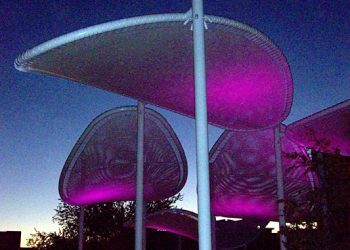 While there are many choices to discuss with your Tension Structures design team, here are some of the more common options to consider. 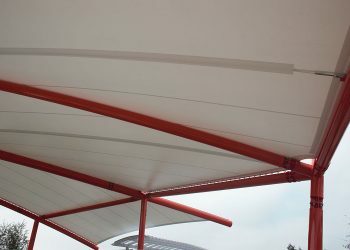 Providing flexibility and easier installation, a bolt drawn extrusion attachment connects the tensile structure fabric to the frame with a series of high-strength tightening bolts. 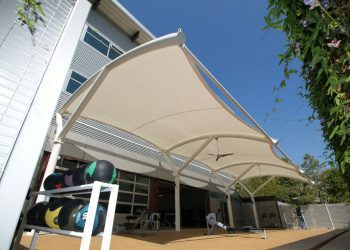 This type of attachment can be adjusted on-site to prevent any wrinkling in the membrane. 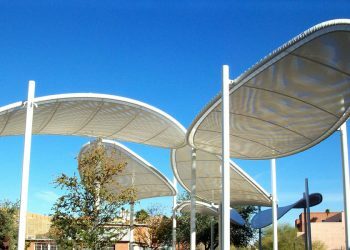 Additionally, the simpler installation saves on-site labor hours, which is imperative for tight budgets. 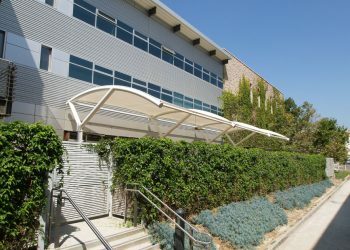 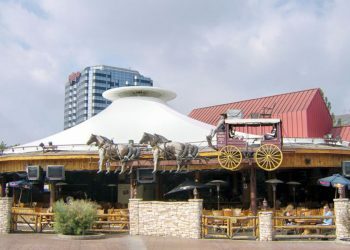 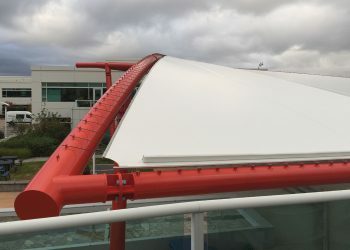 With a low profile and clean appearance, an awning rail attachment connects the tensile structure fabric to the frame using an expertly welded keder cord and heavy-duty aluminum or steel track. 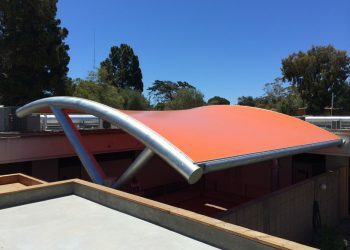 This is an economical solution for short spans and light loads. 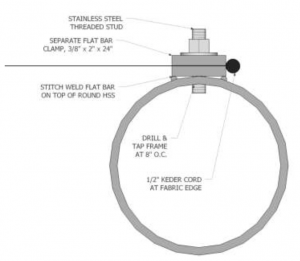 Creating a tight connection for waterproof applications, a clamp bar attachment connects the tensile structure fabric with a system of steel flat clamp bars that hold the welded keder cord tightly in place. 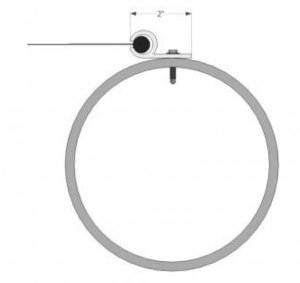 This is a strong attachment that’s ideal for long spans and high-stress designs. 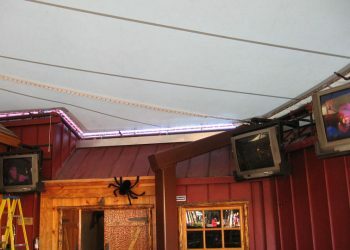 Providing a beautiful nautical aesthetic, a lace rope attachment connects the tensile structure fabric with a series of high-strength grommets and rope. 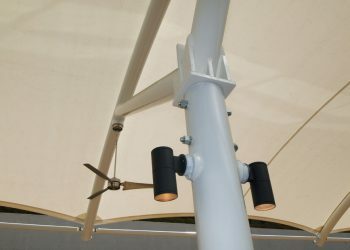 This is an economical option that’s field adjustable during the installation process. 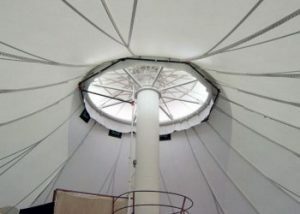 To create a conical design, a center bale ring, edge cables, and columns create the necessary tension in the membrane. 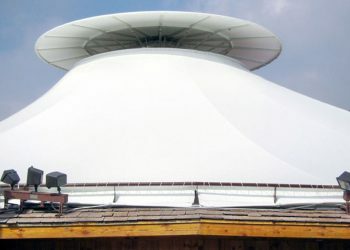 The bale ring is supported either by an internal mast (as seen here) or suspended structural system. 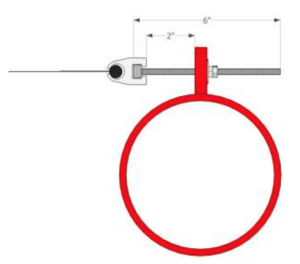 The peak of the cone distributes the load – with larger bale rings receiving less stress.